Waddle to the Milwaukee County Zoo with family and friends on Saturday, April 27, as we celebrate World Penguin Day, which coincides with the annual migration of these unique, flightless birds. Penguins are some of the most beloved animals in zoos and aquariums, and are an important species in our natural world. There are currently 17 species of penguins inhabiting the world today—the largest being the Emperor penguin, weighing nearly 80 pounds, and the smallest being the little blue or “fairy” penguin, weighing ~2 pounds. The Zoo has three penguin species in its collection: Gentoo and rockhopper, located in the Antarctic habitat in the Aviary; and Humboldt penguins, a South American species, located in an outdoor habitat near the Zoo’s main entrance. Don your finest penguin-inspired clothing to draw attention to the plight of wild penguins. The first 100 visitors wearing black and white clothing today will receive a plush penguin toy! Learn about penguin adaptations, like the reason behind their distinctive black and white feathers, and how blubber enables penguins to stay warm and toasty amid the freezing Antarctic temperatures. Color a penguin back into the ocean. Color a paper penguin and add it to the raft (a group of penguins floating at sea is called a raft), to represent doing your part to help these important birds. Purchase paintings made by the penguins at the Zoo! This enrichment exercise keeps the birds active, allowing them to exhibit instinctive behaviors similar to those seen in the wild. All proceeds benefit penguin conservation. Enjoy a special zookeeper talk presented by one of our Humboldt penguin keepers. You’ll learn more about the care involved in making sure the Zoo penguins are healthy and enriched on a daily basis. A day in the life. See a display of the many items zookeepers use to take care of the Zoo penguins, like nesting boxes and enrichment items. Cookies for a cause. Purchase a delicious penguin cookie and help conserve these animals in the wild; all proceeds benefit penguin conservation programs. 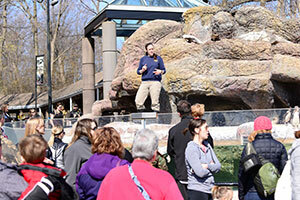 Join the Milwaukee County Zoo from 9 a.m. to 1 p.m. on this special day for all the festivities! Every year at the end of April, scientists have observed penguins returning home after spending months at sea. Researchers began to plan for the penguins’ arrival after observing this phenomenon, creating a time for celebration based on the penguins’ annual migration appearance. For more information on World Penguin Day, contact the Zoo’s Marketing and Communications department at 414.256.2566.